Yakkity Yob was a whimsical robot toy with dreams of becoming a real, live boy. (“Yob” spelled backward is “boy”). 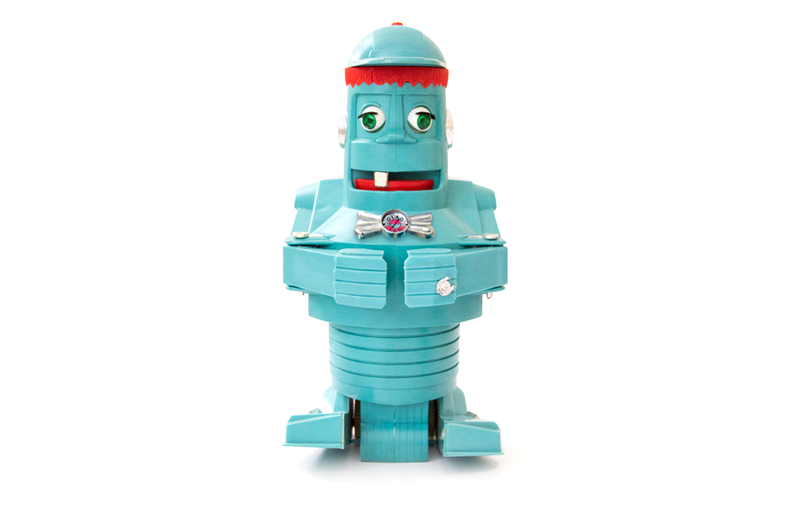 Released in 1961 by Eldon Industries, the 13.5-inch tall robot was designed and patented by Marvin Glass & Associates. His high-impact blue styrene frame was complemented by chrome-plated trim and a comical human face with red hair, a single gold tooth, and green eyes. Yakkity Yob operated like a hand puppet – no need for winding or batteries. A child-sized hand inserted in the toy’s back could access two levers to control the action. One lever could be used to make Yakkity Yob’s hands come together and hold things while his eyes closed and opened. A second lever opened and closed his mouth. A small rubber bulb in his head could be squeezed to emit a squeaking sound. When pushed along a hard surface on his four plastic wheels, the robot would make a clacking sound. For added impact, his cap could be spun around his head and was attached to an ever-bobbing antenna. A silver bow tie with a “Glad/Sad” gauge in the middle completed his outfit. Yakkity Yob’s quirky design, operation, and full-colour, store-quality display packaging make this toy a highly valued fan favourite in the world of collectible robots. The Uncle Sam’s 3-Coin Register Bank is a classic toy bank that brought savings to a new level.